réalisatrice Pascale Obolo La femme invisible par le Professeur Frieda Ekotto. la Chine : Qu'en est-il de la culture ? 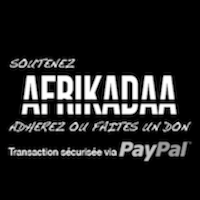 PLACES s'offre un double itinéraire pour le moins dépaysant : une visite de l'Espace Canopy à Paris et une expédition au Musée Royal de l'Afrique Centrale : Tervuren, à Bruxelles. La section DESIGN, présente Ousmane Mbaye, artisan-designer autodidacte émergeant sur la scène du design international. Cet été, EXHIBITION REVIEW a voyagé entre Paris, Casablanca et Manchester! The topic of creating visibility for “invisible” ones is closely linked to the very existence of Afrikadaa. From the beginning, the magazine’s aim was to become a medium for a different outlook on art, social, cultural and political critique, and it was created for expanding the scope of the contemporary art scene by shedding light on non western-centric works. 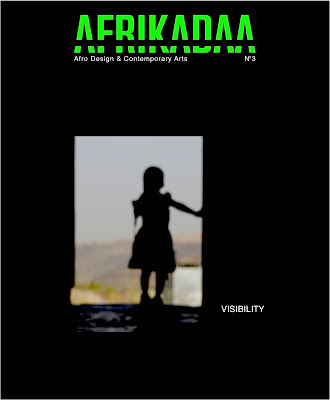 It is then natural that for its third issue, AFRIKADAA ventures into this theme of VISIBILITY. The topic of VISIBILITY is strongly embodied in this issue’s Artist in Focus: the South African photographer and visual activist Zanele Muholi. Activist, Black, lesbian: if all three have been used to describe Zanele, what they truly mean is a painful, constrained invisibility, a right to be seen denied and a struggle for this paramount goal: reaching acceptance of the other, the community, the self. With VISIBILITY, we will introduce a new column: AFRIKADAA’S LIBRARY, a curated selection of books related to this issue’s main theme, that we wished to share with our readers. ART TALK starts with a striking comparative reading by Pr. Frieda Ekotto of Ralph Ellison’s book, “The INVISIBLE MAN” and director Pascale Obolo’s short film “THE INVISIBLE WOMAN”. Following is “Of men and journals”, an article by guest contributor Malick Ndiaye. - “Scraps from trajectories”: an essay on the condition of Caribbean art by Sylvie Arnaud. - “China and Africa : What about culture?” : a second essay by Frieda Ekotto on China-Africa relations in the area of cultural exchange. - “Women reflections and scraps of memories” by Kemi Bassene, will cover the topic of the condition of Black women as covered by Black female artists and writers. In CONCEPT, Sylvie Arnaud introduces us to “Female Portraits”. For the PORTFOLIO column, photographer Mirtho Linguet will reflect on “What makes us visible, and how we can become visible”, as experienced in his “Alchimie” project meaning: “Chemistry”. PLACES will take you on an adventure trip to the Canopy Space in Paris, and at the Tervuren Central-African Royal Museum in Brussels. For the DESIGN section, we met with an incredible self-taught designer Ousmane Mbaye, who, skipping the drawing and planning part of design, started right with the raw material and conquered the international scene. Architect Françoise Akinosho, whose dream is to “make Lagos the next Dubai”, opens up to us about her work in ARCHITECTURE, followed by an essay on the dangerous decay of Dakar’s aging cinemas. CARNET DE BORD will be focused on Congo. First, we will take a trip to the Matongue district and its link to Belgium’s contemporary arts scene, right before historian Lucas Catherine gives us a tour of Brussels’ Congolese heritage. This summer, the EXHIBITION REVIEW traveled between Paris, Casablanca and Manchester. Brace yourself for stunning discoveries! We hope you will enjoy it !! !